Hai Phong is a harbour city, which is situated in an area of paramount importance in economic, defence and security terms in the north coast of Vietnam. On deeply grasping the Party’s strategic guideline on building the Militia and Self-Defence Forces, particularly since the promulgation of the Law on Militia and Self-Defence Forces in 2009, Hai Phong City has paid constant attention to leading and instructing the establishment of “robust, widespread” Militia and Self-Defence Forces, making it become one of the most prominent localities in the 3rd Military Region in this aspect. Given its proactiveness and a strong sense of responsibility, right after the promulgation of the law, the city has focused the bulk of its leadership on propaganda and realisation by means of various measures suitable for its unique features. After 8 years of implementation, the city has recorded positive achievements both in perception and action. State management of the Militia and Self-Defence Forces has been increasingly inextricable, efficient and effective. The Militia and Self-Defence Forces have been strengthened and developed to meet the requirements of size and high quality, and well brought into play their leading role in executing local military and defence missions. To provide a solid foundation for implementation, first of all, the city has sought to well conduct propaganda and dissemination of the Law on Militia and Self-Defence with a view to raising awareness and responsibility of party executive committees and authorities at all levels, the whole political system and people for realisation. The City Military Command has advised the City People’s Committee on working out plans to coordinate the propaganda and study of the law and its related documents, and instructing the Department of Information and Communications and local newspapers and broadcasting stations to enhance the propaganda of the Law on Militia and Self-Defence among cadres, party members and people from different walks of life through a range of diversified forms. Regarding content, the city has highlighted the need to propagandise the role and importance of the Militia and Self-Defence Forces to execution of local military and defence missions and building of the all-people defence; new points in the law compared to the Ordinance on Militia and Self-Defence Forces; responsibility of party executive committee, local authorities and military organisations at all levels for developing the Militia and Self-Defence Forces, and so on. On the basis of a unified perception, the city has concretised requirements stipulated by the law, developed and promulgated a synchronous system of documents to lead and guide the implementation. Accordingly, the city has promulgated dozens of resolutions, decisions, plans and projects regarding the Militia and Self-Defence Forces in each period, such as the People’s Committee’s Project 7495/ĐA-UBND, dated 30 November 2011, on “building of the Militia and Self-Defence Forces of Hai Phong City”; the People’s Council’s Resolution 22/NQ-HĐND, dated 12 December 2011, on “building the Militia and Self-Defence Forces of Hai Phong City for the period of 2011-2015 with a vision for 2020”; the People’s Council’s Resolution 146/NQ-HĐND, dated 13 December 2016, on the “plan to develop, train and use the Militia and Self-Defence Forces of Hai Phong City for the period of 2017-2020”; the People’s Committee’s Plan 3500/KH-UBND, dated 28 December 2016, for “organising the development, training and operation of the Militia and Self-Defence Forces of Hai Phong City for the period of 2017-2020”; and so forth. These are crucial legal grounds for districts, agencies and organisations to continue to concretise and devise plans, and execute them in a synchronous and appropriate manner. On complying with regulations stipulated in the Law on Militia and Self-Defence Forces, the city has stepped up registration, management and building of the forces to ensure adequate quantity, proper organisation and highly qualified staff. Accordingly, the city has concentrated on building core militia and self-defence forces, especially the mobile, standing militia and self-defence forces in offices, organisations, businesses, and maritime militia and self-defence forces. Every year, localities and organisations devise plans for registration and propagandise information deeply and widely among political system at grass-roots levels and the whole people to improve their sense of consciousness, citizenship responsibilities and duties. The registration and selection process is carefully carried out to ensure strict admission and issue of certificates in fulfillment of service in the Militia and Self-Defence Forces. At the same time, there is a need to regularly review, strengthen, dismiss, and appoint managerial staff who are in charge of commanding units of Militia and Self-Defence Forces, commune-level military commands and organisational military commands. In light of difficulties in establishing and strengthening units of Self-Defence Forces in privatised businesses, the city has aligned implementation of the Law on Militia and Self-Defence Forces with the Law on Defence and Security Education; and provided knowledge of defence and security for leaders of offices, organisations and enterprises to foster their understanding of the significance and importance of attaching economic development to defence and security consolidation, thus raising their awareness and responsibility to the development and training of the Militia and Self-Defence Forces. As for building of the Maritime Militia Forces, the city has instructed all of the coastal communes, communes on islands, and communes in possession of vessels operating at sea to set up sections and platoons of the Maritime Militia Forces. members of those sections and platoons consist of owners of vessels, captains, helmsmen, and local labourers who have sufficient qualifications and prestige to control and handle situations at sea. As far as the Maritime Self-Defence Forces are concerned, the city has established units from sections to naval squadrons depending on types of businesses operating at sea. Chosen members are qualified owners of vessels, captains, helmsmen, and crew or 100 per cent of officers and crew of survey vessels, oil rigs, lighthouse stations, and other ships operating at sea. The city has established 545 units of the Militia and Self-Defence Forces so far. Militia units are organised in every village and quarter. One standing militia section is kept in readiness in Cat Ba Town, Cat Hai District. One 37mm anti-aircraft artillery company is kept in readiness in Hai An District. The total strength of the Militia and Self-Defence Forces accounts for 1.56 per cent of the population. They have increased political quality. The building and operations of the Militia and Self-Defence Forces largely depend on quality of military cadres at grass-roots level. To comply with requirements stipulated in this law, the city seeks to enhance the strengthening and cultivation of cadres specialised in militia and self-defence work in military organisations at all levels, particularly the commune-level military commands, through selecting and sending chiefs of commune-level military commands to participate in grass-roots military courses at intermediate and tertiary levels. It has also requested localities to consider and select candidates according to defined processes, and attach training to planning and employment. The city has chosen and sent 470 chiefs of military commands to training institutions since 2010. 342 out of 368 graduates have been arranged work while the rest are commissioned as commanders of mobile militia platoons by local authorities. Therefore, all of the city’s commune-level military commands are sufficiently staffed as stipulated by the Law on Militia and Self-Defence Forces, and capable of bringing into play their role in advising party executive committees and authorities at grass-roots level to lead, instruct and manage local military and defence work. In addition, the city has attached importance to improving the Militia and Self-Defence Forces’ quality of training and operations. On the basis of the 3rd Military Region Party Executive Committee’s Resolution 183-NQ/ĐU on “intensifying leadership and instruction on improving the Militia and Self-Defence Forces’ quality of building, training and operations to satisfy demands of the new era,” and order of Commander of the 3rd Military Region for military and defence work to be executed, every year the City’s Military Party Executive Committee adopts a theme resolution to lead training task, and the City’s Military Command works out plans to educate and train the Militia and Self-Defence Forces in politics and law. Also, the City’s Military Party Executive Committee directs districts to develop their training plans, which are concrete and close to realities in each locality, organisation and unit, and clearly identify training content, time and strength. Prior to training, the City’s Military Command conducts training courses for managerial staff and commanders of the Militia and Self-Defence Forces units in echelon. Notably, the city instructs to deliver concentrated training for the Militia and Self-Defence Forces according to clusters of communes and wards, and deliver training for the Militia and Self-Defence Forces of other arms according to districts. After training, 100 per cent of participants take part in competitions, demonstrations and live firing exercises, thus drastically improving training quality. Moreover, the city steps up inspection and examination of training, and practises mobilising the Militia and Self-Defence Forces to participate in commune-level defence zone exercises and defence combat exercises. Particularly, Hai Phong fulfilled the task of carrying out a commune-level defence combat exercise as an exemplar for the Ministry of National Defence in 2015. In order to promote the Militia and Self-Defence Forces’ role, the city has instructed localities, organisations, self-defence units, and other forces in the area to develop and conclude statutes for coordinating activities in defending borders, waters and islands, political security, social order and safety, and protecting and preventing forest fires. So far, 100 per cent of districts, communes, wards, and towns have developed statutes and plans to coordinate activities among various forces; make good preparations in terms of facilities, forces and vehicles; regularly grasp and predict situations to advise party executive committees and authorities to opportunely deal with complex issues arising right in their localities and organisations without giving rise to “hot spots,” making contribution to firmly preserving political security and social order and safety in the area. Apart from the aforementioned content, the city has paid constant attention to well realising policies on the Militia and Self-Defence Forces. On the basis of regulations stipulated in the Law on Militia and Self-Defence Forces, the Military Command has worked with the Department of Finance and the Department of Home Affairs to advise the City People’s Council and the City People’s Committee to issue resolutions guiding execution of some entitlements and policies on the Militia and Self-Defence Forces in line with the city’s budget capacity. Over the past few years, the city has allocated over VND371.3 billion to opportunely realise entitlements and policies on the Militia and Self-Defence Forces as provided in law while actively mobilising resources needed for procurement of equipment and supporting tools, and building and consolidating training grounds dedicated to the Militia and Self-Defence Forces’ training and operations. 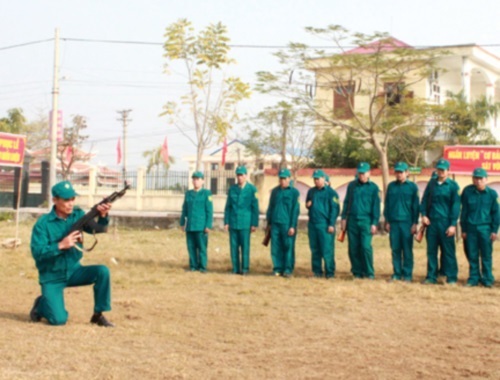 Capitalising on attained outcomes, in the time to come, Hai Phong City will continue to better grasp and execute the Law on Militia and Self-Defence Forces with a focus on “plan to organise, build, train, and use the Militia and Self-Defence Forces of Hai Phong City for the period of 2017-2020,” and well fulfill its local military and defence missions, making contribution to firmly preserving political security, social order and safety, and defending the socialist Vietnamese Fatherland.